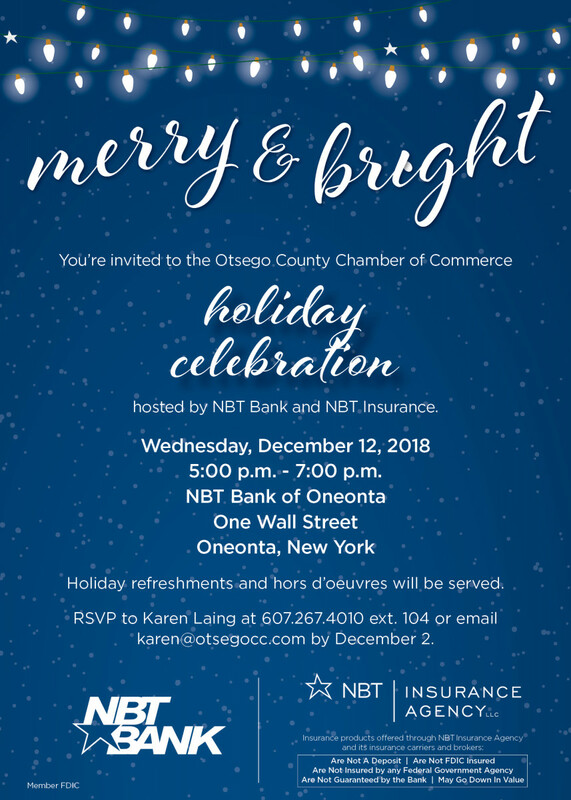 We invite you to our upcoming Holiday Celebration on Wednesday, December 12, 2018 hosted by NBT Bank and NBT Insurance in celebrating the success of Otsego County Businesses. See attached invite. – Friday, December 14 • 7:00 p.m.
– Saturday, December 15 • 2:00 p.m. and 5:00 p.m.
– Sunday, December 16 • 3:00 p.m.
(COOPERSTOWN, N.Y.)— The Farmers’ Museum in Cooperstown presents four live performances of Charles Dickens’ beloved classic A Christmas Carol on December 14, 15, and 16. The play, adapted from the original text by Danielle and Michael Henrici, tells the story of Ebenezer Scrooge, a bitter old man who devoted his life to money and business until three ghosts show him the error of his ways. Michael Henrici directs and also stars as Scrooge. The production embodies the spirit of the season and is a perfect way to celebrate the holidays with family and friends. Four performances will be presented on Friday, December 14 (7:00 p.m.), Saturday, December 15 (2:00 p.m. and 5:00 p.m.), and Sunday, December 16 (3:00 p.m.) in the Louis C. Jones Center at The Farmers’ Museum. Order tickets online at FarmersMuseum.org or purchase your tickets at the door on the evening of the performance. Tickets are $15 adults (13-64); $13.50 seniors (65+) and museum members; $10 juniors (7-12); children 6 and under are free. Concessions will be available. If you have questions about the performance, please call Michael Tamburrino at (607) 547-1453. A Christmas Carol is generously sponsored by Matthew Sohns and family. The Farmers’ Museum is located at 5775 Route 80 in Cooperstown, NY. For more information, visit FarmersMuseum.org. Emerald ash borer to be the topic of a presentation in Oneonta on Wednesday, December 12. (ONEONTA) — The City of Oneonta and the Otsego County Conservation Association will be co-sponsoring a talk on the emerald ash borer on Wednesday, December 12 at 6:30pm. This free talk will take place at the Otsego County Chamber of Commerce, 189 Main Street, Suite 500. An invasive insect from eastern Asia, the emerald ash borer (EAB) attacks and kills all species of ash trees. Since it was first found in the United States in 2002, EAB has been responsible for the death of millions of trees in the United States and Canada. Its presence in Otsego County was confirmed in 2014 in Unadilla. The program features a presentation by Dan Snider, field projects manager for the Catskill Regional Invasive Species Partnership (CRISP). Snider will cover emerald ash borer biology, ash tree identification, and signs of emerald ash borer infestations. The program will also include a discussion of best management practices for infested areas, and how citizens can contribute to research programs to preserve ash trees in the landscape. In 2017, the City of Oneonta received an Urban and Community Forestry Grant to develop and implement the Emerald Ash Borer Maintenance Program. As part of the plan, the City removed a number of ash high-risk ash trees from streets and parks, inoculated others with insecticide to protect against infestation, and conducted a number of outreach and education programs. Judy Pangman, Community Development Director for the City of Oneonta, will be on hand to discuss the progress of the program. Ryan Mathews, Engineer I for the City of Oneonta, said the tree removals were done in the interest of safety. The program is free and open to the public. For more information, contact OCCA at (607) 282-4087. The program is made possible by an Urban Community Forestry grant received by the City of Oneonta. The Urban Community Forestry grants are funded through the State Environmental Protection Fund. They are part of New York's ongoing environmental initiatives to promote clean air, clean water, energy savings and habitat creation and to address invasive species, environmental justice and urban sprawl. UCF grants are awarded by the Department of Environmental Conservation.